Recently I (Tom) started taking an online course over at MOOC provider Coursera. What does that possibly have to do with geeky t-shirt designs? Well, let me tell, and show, you. The course I’m taking is Synapses, Neurons, and Brains taught by Idan Segev at The Hebrew University of Jerusalem. His enthusiasm for his subject is infectious, though I come to the course already infected. But I’m merely self educated at a surface level in the subject, so I jumped at this chance to take a course from a real brain. A surprisingly effective path to discovery in science is to break things. For example, biologists love their “knockout mice,” wherein researchers disable specific genes in order to study the consequences for the mice. OK, that’s a twisted use of the word love, but you get the idea. Back to t-shirts and neuroscience. I love visual illusions and recently I’ve been working on our growing illusions category. I think of illusions as a delightful way to gently and temporarily break the visual cortex – or at least cause an argument inside it. They are also a clear illustration of just how little of your own brain you are in control of. With illusions, knowing it’s wrong will not make the visual confusion stop. The intense neural processing that it takes to see the world begins in your retina and proceeds all the way to the back of your brain, where the heavy lifting is done, far away from peering eyes. Along the way there can be disagreement as to just what is being seen, and from this disagreement both illusions and insight can emerge. A very simplified take on many illusions is that they result from disagreements between different parts of the “seeing workflow” in the visual cortex. Things that make sense at a detailed level (small part of the visual field) are not consistent with higher-level conclusions about the bigger picture. Here are two exhibits for your consideration. The one on top is a static illusion, while the one below it is an example of a motion illusion. A Motion Illusion. This is not an animation. In the Devil’s triangle each corner looks legitimate by itself, but a glaring problem arises at a higher level when those corners are put together into one object. Our brains have a learned sense of what can exist in three dimensions, which collides with its attempt to interpret this image as a representation of a solid object. 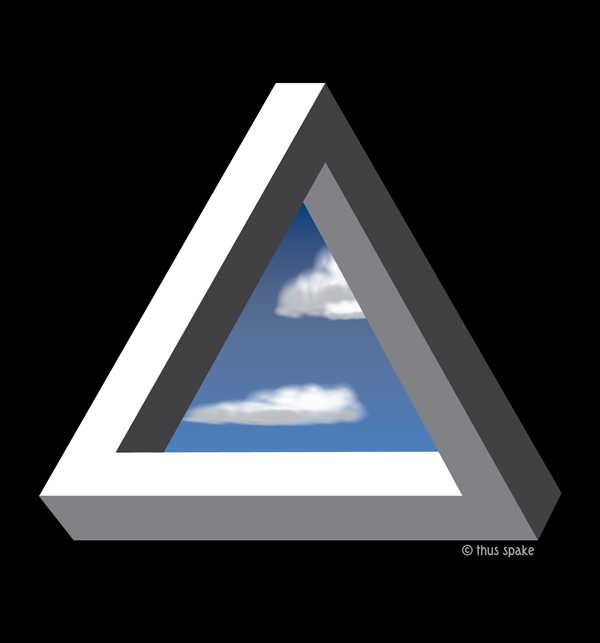 As an amusing aside you can build a physical model of the impossible triangle but the catch is it only looks right – in the wrong sense – when viewed from a single angle. The second image is even more interesting, to my mind at least. Here there are actually two illusions. The most obvious one is an odd kind of rolling motion apparent over the field of circles if you don’t hold your gaze very still or if you look off to the side. The other illusion is that there appears to be an ephemeral grid of faint, thin grey lines running between the circles. There is no motion and there are no gray lines. I’m certain of that because I wrote the code that made this image. 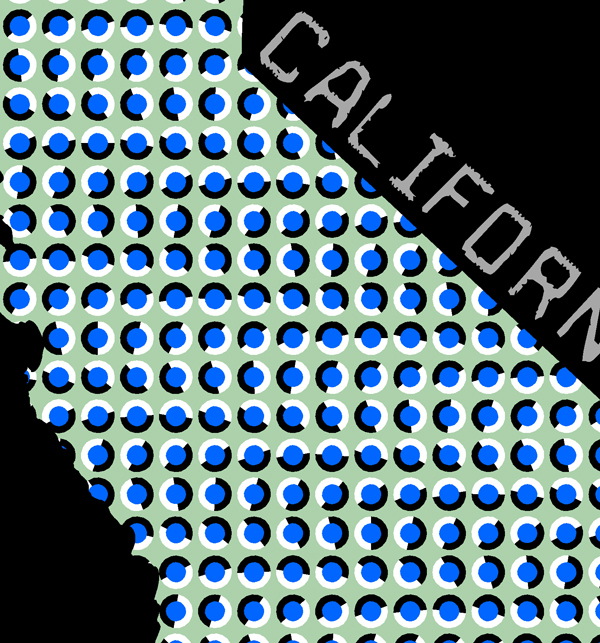 You can click on it to see a larger version, which might make the ghostly grid more apparent. Here’s my take on the second illusion, at least the rolling motion part. Lower-level parts of the visual cortex (VC – this is getting geeky so we need at least one acronym here) interpret each circle as a shadowed object due to the high-contrast black and white circumference surrounding the blue interior. If you make a version of this image with the orientation of all the black/white surrounds the same, the motion will vanish. But because I’ve introduced a small rotation of the circumference from one circle to the next, the implied changing shadowing is dissonant to higher levels in the visual cortex. Why? Because the big-picture part of our VC evolved in a world with a single bright light source high in the sky, and so the array of close by circles should all have very similar if not identical shadowing. The one aspect of the natural world that can cause shadows to change their location is motion of the object or light source. So a higher level “injects” some motion into your overall sense of the image in an attempt to reconcile what lower levels are telling it. If you force your gaze to remain very still on one circle the motion will stop because not enough of the changing mock shadowing is available to the higher levels. That’s my guess. What do you think? I have no idea if I’m right about this. But I do know that using this idea has not only let me understand many motion illusions out there, but has also made it relatively easy to make my own. There’s a lot more to getting a motion illusion to work well, but starting with this idea of implied shadowing dissonance has worked well for me so far. As for the illusory grid I have only a wild guess: could it be that some part of the VC is trying to isolate the circles from one another? I guess I’ll have to add a real grid and see if that stops the motion. Maybe that’s a future post. I really want to believe these envelopes will compost to useful organic matter. I think this is a perfect opportunity for a little tee-shirt based science fun that will let me know, rather than believe. So I’ve cut one of these bags, which feel like plastic to the touch, into six strips. I’ve put two strips each into three glass containers we had lying about. Karin claims they are meant for glowing candles, but to me they looked perfect for either an ant farm or this experiment. Anyway, I’ll be documenting here the progress of this little effort at determining the rot rate of our environmentally-friendly packaging. 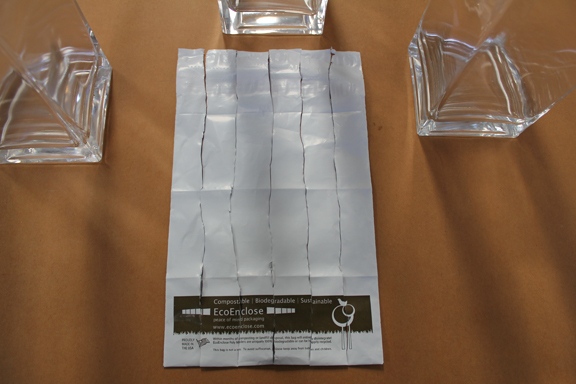 Here is one of the shipping bags cut into strips. I’ve labeled each strip January 7, 2011, the day it was put in the dirt. The soil was recommended by the local nursery as having the highest organic matter content, all the better for the degradation process. 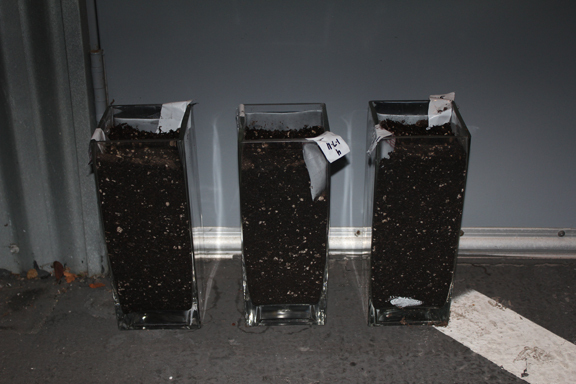 The strips in their containers, and the soil we’ll be using. My plan is to remove one of the six strips every three months. Then I’ll post a picture of what it looks like after it’s washed off. Unfortunately, I didn’t weigh each strip before putting them in the dirt, but that just creates an opportunity for me to do another, better experiment later. According to the product specs, full degradation occurs in 9 to 60 months. It’ll be fun to see how far these little strips get in 18 months. This is a situation where bugs are good, real good. Go bugs!